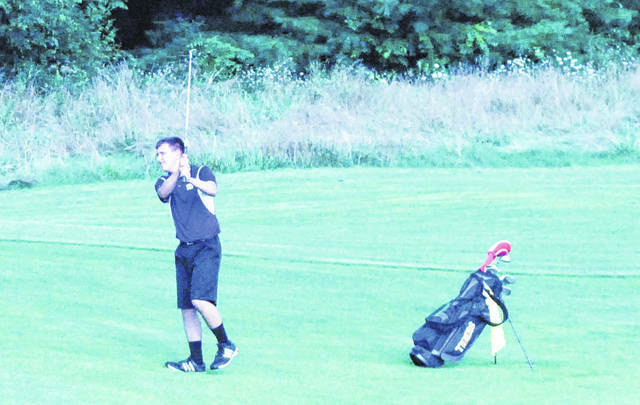 McClain Trenton Newkirk hits his second shot on the second hole at Buckeye Hills Country Club in Greenfield on Thursday, August 9, where the Tigers battled Madison Plains in a non-conference golf match. The Tigers placed second on Saturday, August 11, in the Unioto Invitational with a score of 172. McClain’s boys golf team traveled to Chillicothe on Saturday to participate in the Unioto Invitational at the Forrest Everhart Memorial Golf Course located on the campus of the Chillicothe VA. The Tigers posted a team score of 172 to finish in second place at the event. The boys from Greenfield had to navigate a field of competitors that included teams from Unioto, Jackson, Gallia Academy, Westfall, Zane Trace, Southeastern and Vinton County to earn their second place finish. Unioto, the host of the tournament, claimed first place with a final score of 158 and Jackson was third behind McClain with a score of 173. Gallia Academy carded a 198 to claim fourth place, Westfall finished with a 202 in fifth, Zane Trace had a 203 in sixth, Southeastern shot a 206 in seventh and Vinton County was eighth with a score of 227. The Tigers were led by Trevor Newkirk as he carded a 38 in the nine hole event. Also scoring for McClain were Kobe Penwell with a 40, Trenton Newkirk and Zane Mustard who each finished with a 47 for the Tigers. McClain continued their strong start to the season that has seen them post a record of 15-8 overall. The Tigers will be back in action today when they travel to Franklin Valley Golf Course to take on Fontier Athletic Conference foes Chillicothe, Hillsboro, Jackson, Miami Trace and Washington in the second FAC match of the year. The Tigers took home fifth place in FAC match number one at the Hillsboro Elks Golf Course as they shot a 204 on the day. Reach Ryan Applegate at 937-402-2572, or on Twitter @RCApplegate89.